Is there such a thing as “must-miss” TV? If so, put “Amish Grace” on your list. The Lifetime Movie Network film, which airs March 28, purports to recount the shooting of 10 Amish girls in a Nickel Mines schoolhouse by Charles Carl Roberts IV on Oct. 2, 2006. CHRIS KNIGHT, The Patriot-News Movie about the Amish is shameful. There has always been a fundamental contradiction in the fact that the “English” — as the Amish call non-Amish — make money off an intensely private people who reject the values of modern society. Lancaster County has spawned an entire industry of Amish tourism, with busloads who ogle at horse-drawn buggies and men in straw hats. Few who know the Amish wanted a piece of this horror show. The fictional film is based on the nonfiction book “Amish Grace: How Forgiveness Transcended Tragedy,” by Donald B. Kraybill, Steven M. Nolt and David L. Weaver-Zercher. Kraybill is an Elizabethtown College professor and senior fellow at the Young Center for Anabaptist and Pietist Studies. “Out of respect to our friends in the Amish community, and especially those related to the Nickel Mines tragedy, we declined the producer’s requests to consult and assist in the development of a film,” the authors said in a written statement. This film has about as much to do with understanding the Amish as “Avatar” has to do with understanding the Masai. As Patriot-News writer Ivey DeJesus described it, in the world of “Amish Grace,” the men all wear squeaky clean boots with no trace of farm mud and the women all sport manicured fingernails. More importantly, the film distorts what happened. “I can’t stand this place anymore,” says a character who lost her daughter in the shooting and lashes out at her husband. 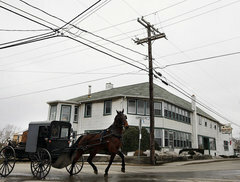 In reality, the Nickel Mines tragedy only caused the Amish to affirm the bedrock values of their community. In reality, the public — including this newspaper — marveled at the Amish for truly living their deep faith. It is inevitable that Hollywood tries to idealize and romanticize just about any hardship, from slavery to poverty to cancer. But there is a special irony in glamorizing a people whose entire life is dedicated to eschewing individual attention. You cannot see a shadow by shining a light on it. You cannot capture smoke by grabbing it with your hands. And you cannot celebrate the humility of the Amish by making them the stars of their own Lifetime movie. If the film’s producers really wanted to honor the Amish, they would have said a prayer for them and let them be.